Birthplace : Jacksonville, Texas, U.S.
Lee Ann Womack is an American country music singer and songwriter, who is best-known for her old fashioned-styled country music songs that often discuss subjects such as cheating and lost love. Her 2000 single, "I Hope You Dance" was a major crossover music hit, reaching #1 on the Billboard Country Chart and the Top 15 of the Billboard Hot 100, becoming her signature song. Lee Ann Womack was born Aug. 19, 1966, in Jacksonville, Texas. Her father was a part-time disc jockey who frequently took her to the studio and let her pick out records for him to play. (Bob Wills, Ray Price and Glen Campbell were her favorites.) At home, she would lie between the stereo speakers and -- when the weather conditions were right -- absorb the music beaming in from the Grand Ole Opry. Instead of taking her senior trip with her class, she bargained with her parents for a visit to Nashville where she toured Music Row and watched TNN tapings. Initially, Womack studied music at South Plains Junior College in Levelland, Texas, one of the first schools to offer a degree in bluegrass and country music. She quickly became a member of the school band, Country Caravan, and toured with it throughout the Southwest and Southern California. Subsequently, she enrolled in Belmont University's music business program in Nashville, which enabled her to intern in the A&R department at MCA Records. In 1990, she moved to Nashville permanently. During her stay at Belmont, Womack married songwriter Jason Sellers (which ended in divorce a few years later), became a mother and stayed home for a couple of years. Then she showcased around town and sang demos for songwriters. She also concentrated more on her own songwriting and signed to Tree Publishing in 1995. A year later, she signed as an artist with Decca Records, the legendary label of Ernest Tubb, Patsy Cline, Webb Pierce and Loretta Lynn. In 1997, her first single, "Never Again, Again," stunned radio programmers with its traditional country sound and only climbed to No. 22. However, with endorsements from Alan Jackson, George Strait and other torchbearers, Womack rose to the No. 2 spot four times with singles on Decca, including "The Fool," "You've Got to Talk to Me," "A Little Past Little Rock" and "I'll Think of a Reason Later." When the label shuttered, she moved to MCA Nashville. Womack gave birth to a daughter, her second, and married her producer Frank Liddell in 1999. Both daughters appeared in her video for "I Hope You Dance," her biggest hit to date. The single spent five weeks at No. 1 and crossed over to the pop and adult contemporary charts. She picked up the CMA female vocalist award in 2001 and "I Hope You Dance" was named the CMA's song and single of the year. The corresponding album sold 3 million copies. Her 2002 follow-up, Something Worth Leaving Behind led to poor sales, no major hits and a misguided attempt at a glossy, pop-flavored attitude, Womack's career stalled. She strayed even further from traditional country music with the Big Band-inspired Christmas album, A Season for Romance. Nevertheless, a hit collaboration with Willie Nelson, "Mendocino County Line," won a Grammy and a CMA award in 2002. In 2005, she returned to traditional country music with There's More Where That Came From. The album won CMA Awards for album of the year and single of the year ("I May Hate Myself in the Morning"). She is expected to release a new album in early 2007. In October 2010, Womack contributed the new track "Liars Lie" to the soundtrack for the film Country Strong. Womack also contributed guest vocals to Alan Jackson's cover of the song "Ring of Fire," which was released in December 2010 as a single from his compilation album, 34 Number Ones. His version of the song was a minor hit, charting to number 45 on the Hot Country Songs charts. Though Womack is featured on the song, she was not given credit on the charts. 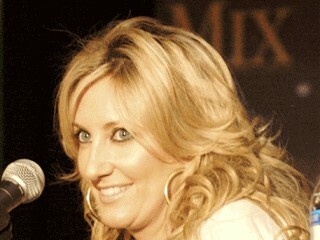 View the full website biography of Lee Ann Womack.